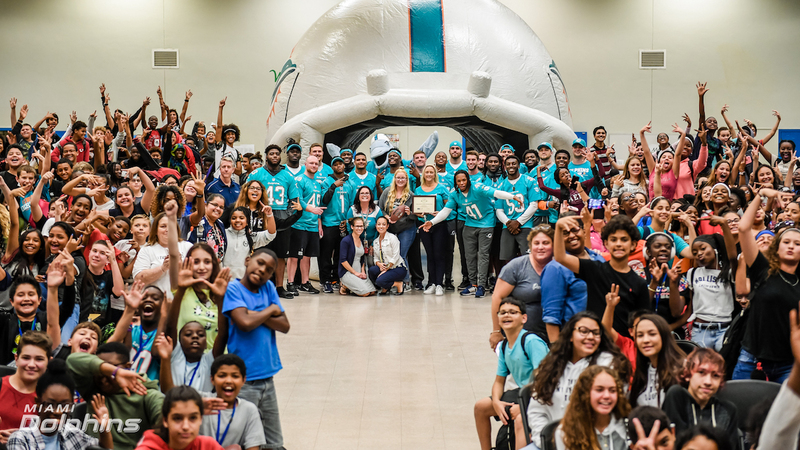 – The Miami Dolphins rookies, United Way of Broward County and educators from Forest Glen Middle School recognized middle school students active in the Character PlaybookTM program, an education initiative focused on youth character development and building healthy relationships. Character PlaybookTM is the latest innovation in the more than 40-year partnership between the NFL and United Way. The Miami Dolphins and United Way of Broward County bring this web-based program to schools throughout Broward County, and have reached more than 2,700 students in almost 50 schools since the program’s inception in spring 2016. Students at Forest Glen Middle School received certificates today for their outstanding work within the program. The event featured remarks from students, administration and United Way of Broward County Director of Educational Initiatives Robin Molan. Students also enjoyed a panel led by Miami Dolphins players Johnathan Alston, Cornell Armstrong, Jerome Baker, Kaylen Ballage, Cayson Collins, Jalen Davis, Minkah Fitzpatrick, Mike Gesicki, Lucas Gravelle, Connor Hilland, Buddy Howell, Greg Joseph, Claudy Mathieu, Mike McCray, Anthony Moten, Jamiyus Pittman, Quentin Poling, Quincy Redmon, Jason Sanders, Durham Smythe and David Steinmetz to discuss character development and decision-making. The Character PlaybookTM initiative was launched nationally during the 2016 NFL Draft and is powered by education technology leader EverFi, which works with more than 20,000 K-12 schools. Character PlaybookTM modules are designed to help students develop healthy relationships and social norms. The program will be evaluated by measuring student knowledge gains as well as attitude and behavioral change.